In two separate incidents, three persons including two children drowned in Sivasagar district within 48 hours. In one incident, Pramod Gogoi, a resident of Konwarpur Chiripuria village under Sivasagar Police Station, drowned in river Dikhow on Thurs day evening. However, the body of Gogoi, who was an employee of the Inland Water Transport Department (IWTD) deployed at Dikhowmukh ferry ghat on the outskirt of Gaurisagar of Sivasagar district, was recovered on Sunday morning. It has been suspected that on Thurs day evening, Gogoi, might have swept away by the current of the river water while trying to cross the river by swimming as there was no boat at that time. “When he did not reached home, his family members started searching him but could not find. On the other hand, the locals noticed his bicycle and clothes on a tree on the bank of the river at Chiripuria ghat. They immediately informed it to the Sivasagar Police Station,” informed sources. Sources also stated that along with locals, the Sivasagar Police and State Disaster Response Force (SDRF) launched a search operation but failed to trace him out. 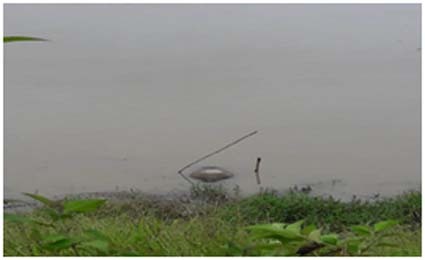 On Sunday morning, the locals witnessed a body floating near Bokabeel, a tributary of river Dikhow and informed it to the police and the family members of Pramod Gogoi. The family members then identified the body as that of Gogoi. Later, police recovered the body and sent it for post-mortem. After post-mortem, his body was handed over the family and his last rites were performed in a gloomy atmosphere. He is survived by his wife, one son, one daughter and a host of relatives. In another incident, two children, namely 7-year-old Pallav Pasuwan, son of Ramesh Pasuwan and Dipika Pasuwan, and 9-year-old Raja Ghatowar, son of Jiten Ghatowar and Ranjita Ghatowar, residents of Dhaluwa Pathar Basti under Haluwating Police Station in Sivasagar district drowned in a pond on Saturday evening. According to reports, after coming from school, the two minor boys went out for taking bath and drowned.